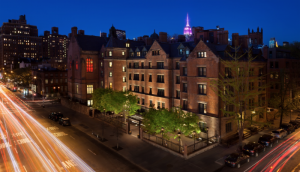 Global Travel Media » Blog Archive » The Fastest Free Wi-Fi In NYC Is At The High Line Hotel! The Fastest Free Wi-Fi In NYC Is At The High Line Hotel! The High Line Hotel is zooming into 2019 with an unprecedented 1GB of Wi-Fi speed, making it the fastest free Wi-Fi of any hotel in New York City. The service is entirely free of charge and aggravation. That means no infuriating login barrier, no premium upcharge, no need to enter a room number for access. Whether you’re working on your novel in the cozy lobby, attending a gala or conference at the stunning, 8,000-square-foot Hoffman Hall or staying warm with an Intelligentsia espresso in the front garden, free Wi-Fi is only one click away. HDTVs with 50+ premium channels. State of the art conferencing docks and projection equipment in meeting rooms. Free unlimited international and local calls on modernized 1922-era rotary-dial telephones. Prefer the analog life? The High Line Hotel spins vinyl in the lobby on a Shinola Runwell Turntable and offers vintage typewriters and custom embossers for all of your correspondence needs. To make a reservation, please call (212) 929-3888 or visit thehighlinehotel.com.